Unicorn Booty: What is Pluma? 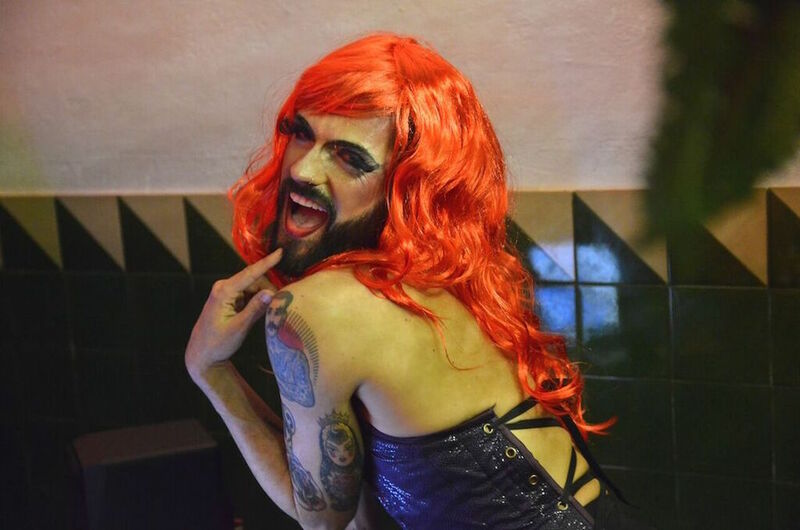 Jono Kitchens: Pluma is a DIY, monthly dose of Drag-Queer-Experimental performance and celebration of everything that makes us fags, queers, lesbians and allies. In a world full of straight-acting, bearded, dom-top daddies, it seems there’s less space for those who sit on the outside of the parameters of “masc4masc.” I instantly knew I wanted to reclaim the term and create a space where the femme boys, the faggots, lesbians, drag queens, kings and allies could all hang out, dance and have fun together. Having come from the drag scene in East London I also wanted the night to include performances of all types, a safe space for people to dance, sing, recite poetry, burp the alphabet, lip-sync, striptease, whatever!! I had met Dino Real, a goddess from Costa Rica, through some mutual friends, and we decided to partner up on making the night happen. He also comes from a cool background of performance-based queers, so it seemed like a great match. Together we came up with the concept, found the right venue and a selection of varied performers—and Pluma was born! How was the first party, and when is the next one? After a day of excitement/nerves, we opened the doors at 10 p.m. and there was already a small gathering of people arriving. By 11 p.m. we had a busy bar full of gorgeous creatures who had dressed up for the occasion. Shows began at midnight, with performances from myself, Dino Real, Dirty Pony and Amazonas. After the shows, the party continued with an eclectic mix of pop, electronic, house and disco. The next Pluma is Thursday, March 16, and it will continue on the second Thursday of each month at La Casa De La Pradera, Barcelona.